Terriers began second half action on the road against Harvard and came away with a hard-fought 2-2 overtime tie. Joel Farabee’s power play goal in the third period eliminated a 2-1 Crimson lead. BU had taken an early lead on Matt Quercia’s first NCAA tally. Ryan Cloonan raced down the right side and backhanded a pass to Quercia who had driven to the net and beat Harvard’s Michael Lackey. Jack DeBoer also picked up an assist. Co-captain Bobo Carpenter nearly doubled the lead after taking a Farabee feed in tight, but was turned away by Lackey. 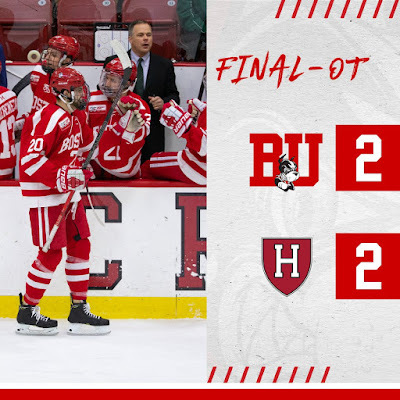 The score remained 1-0 until the final two minutes of the middle period when an unmarked Adam Fox skated to the high slot and beat Jake Oettinger high to the stick side. Harvard began the third period on a power play and just before it ended, they broke the tie. An initial shot from the right circle hit Crimson forward Jack Drury attempting to screen Oettinger and caromed right to Lewis Zerter-Gossage in the slot and he slid the puck home. Four minutes later with BU on a power play, Patrick Harper skated into the offensive zone and found Farabee in stride. The freshman wing, who had just returned from earning a silver medal at the World Juniors with Team USA, ripped a wrist shot from the right dot past Lackey high to the stick side. Oettinger picked up his first career assist on the goal. In overtime, Harper set up Patrick Curry for a one-timer from the right circle, but Lackey swatted it away. Oettinger finished with 26 saves, while Lackey stopped 29 BU shots. Terriers will be back in action Friday, hosting New Hampshire, followed by a road trip to Providence on Saturday. 2019 recruit Ethan Phillips scored a goal and an assist for Team West in its 5-3 win against Team East in the USHL/NHL Top Prospects Game. Fellow recruit Robert Mastrosimone found the net twice for Team East. The two future Terriers were named MVPs of their teams. 2022 recruit Lane Hutson was named to the International Silver Sticks all-tournament team after helping Honeybaked Bantam AAA win the tournament championship. Congrats to the @HoneyBakedHC’04 team, champions of the 57th annual International Silver Stick Finals in Port Huron.